While not flashy on the outside, this simple application does a lot of work behind the scenes. The app is built on a web scraper that pulls data from a public site, and matches it to client data. 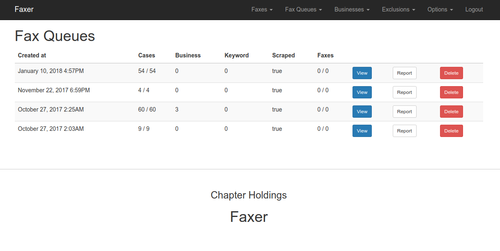 If a match occurs, the app owners can initiate a fax to the client, which is built from both client data in the system, and information gathered from the web scraper.